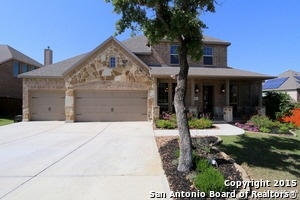 Description: Absolutely gorgeous highland home near ih 10 & 1604! 2 living plus media room! Impressive hickory hand scraped floors! Beautiful entry w/curved stairway & iron balusters! Awesome kitchen w/knotty alder cabinets/granite/gas cooktop & pass thru for entertaining!! Fab downstairs master plus 5th bed down w/bath! 2 living plus media room! Walk in texas attic! Jack-n-jill bath up plus bedroom with own bath! Lush landscaping! Walk to pool!Tons of walk ins and lots of storage! Immaculate & ready for new owner!